In-ear headphones can deliver awesome sound to your ears, but many of us might not be aware of just how good they can be because we insist on using the cheap sets included with our smartphones and never find the time - or money - for an upgrade. But guess what? You're worth it. And it doesn't have to cost a fortune. Even a small set up in terms of headphone quality can bring you a pair of headphones that can achieve ideal sound isolation from the outside world and stop what you're listening to from spilling out. Sennheiser's Momentum In-Ear earphones are a great option because they bring just excellent sound with versatile, tuned drivers. Additionally, the full feature set and spiffy design make the $99 (£89, about AU$125) price a very easy pill to swallow. Similar to the Sennheiser Momentum Wireless over-ear cans, these in-ear headphones live up to the name with an active design that's as sporty as it is sophisticated and would look at home in the office or at the gym. 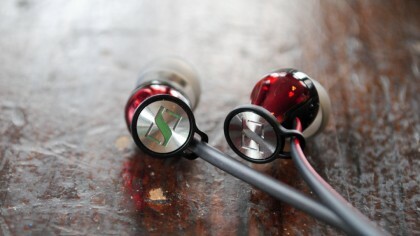 Splashed in red and black, the matte and glossy textures help to accentuate the main features of the Momentum In-Ear. The housing units that hold the drivers are slightly bulbous in shape and feature two pieces of dark, metallic red and glossy black plastic. They each come to a point on one end at the cylindrical stainless steel tubing where sound is delivered through. 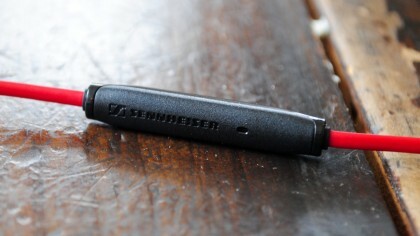 On the other end, Sennheiser embossed its logo onto a regal, spun metal cap. Extending out from the earphones, the cables are guided through a loop at the site of connection, preventing them from getting twisted and frail over time. It's something that's not likely to happen anyway, as these cables are flat and are inherently less likely to get twisted. There's an adjustable stopper to further aid in keeping the cables tidy. There's a set of inline controls on the cable that reaches upward into the right earphone that also has an integrated microphone on its backside. Functionality here is pretty run of the mill, but you'll need to make sure that you select the right model for your phone. We were sent a review sample that works only in full with Samsung Galaxy smartphones. Being an iPhone user, the headphones still worked perfectly and the functions to play, pause and make calls worked just fine. That said, I couldn't utilize the volume increase and decrease buttons. Fortunately, there's a model out there for virtually every brand of smartphone. It seems as if Sennheiser paid just as much attention to detail with the packaging as it did with the earphones themselves. Inside the box is a tough, square-shaped zip case coated with smooth fabric and red stitching. Opened up, the headphones and inline remote are neatly packaged inside. Fortunately, they are just as easy to put back in as they are to remove from the case. 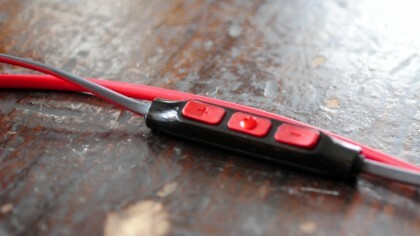 Lastly, there are four different sizes of eartips included – in case the defaults aren't a good fit. Things really click when a product's performance mimics the best qualities about its design. In the case of Sennheiser's in-ear Momentum model, the sound quality achieves what its design does well, as in offer a little something for everyone. As I stated earlier, these earphones are sporty, yet sophisticated in appearance. Just the same, its fantastic sound performance blankets over a similarly wide swath of listeners. If you're jumping up to these from a standard, cheap set of in-ear headphones, prepare for some impressively full sound. Once seated into your ears, the drivers inside these earphones are capable of providing booming, yet tight bass response to tracks of essentially any genre. The sound signature presented in this tiny package is warm and presented on a large soundstage wherein it's quite easy to pick apart instruments and layers of a song. 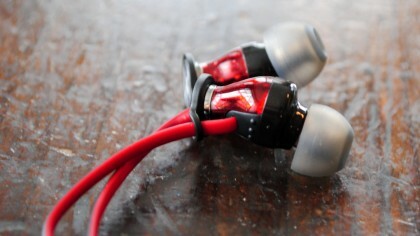 Most will heartily enjoy the sound presentation put forth by the Momentum In-Ear. But there will be a few who notice that, while the bass is punchy and the treble is pleasant, there isn't as much to enjoy in the mids. All said, these tweeters sound just about as good as $100 is going to get you. Comfort can be an issue for some who use in-ear headphones, as the inside of everyone's ears are unique. The Momentum headphones avoid that problem primarily because the earphones themselves are quite light. What helps more is that the size variety of eartips included should accommodate to most inner-ear sizes. Splitting up the models by smartphone brand is a confusing move on Sennheiser's part. But thankfully, the fragmentation doesn't drastically affect the overall quality of the product, so long as you get the correct model. If your budget allows for a $100 set of in-ear headphones, you'll be greatly rewarded by the value packed into Sennheiser's Momentum In-Ear. The stunning design, with tangle-free cables and inline controls, will get you in the door, but the sound quality will keep you in the Sennheiser house.